Laminating machines used to be thought to be used only for the most important papers or just for office use. Not everyone had easy access to them. However, best laminating machines are getting more and more affordable. Do you have a favorite picture your child drew that you want to keep safe? Or maybe you keep spilling on your favorite recipes. Whatever it is, laminating your important papers has never been easier. You can easily afford an at home laminating machine to keep everything safe from water damage or wear and tear. When choosing which laminating machine to buy, there is an overabundance of options to choose from. We have chosen the top five options and broken them down to make buying a new laminating machine as easy as possible. 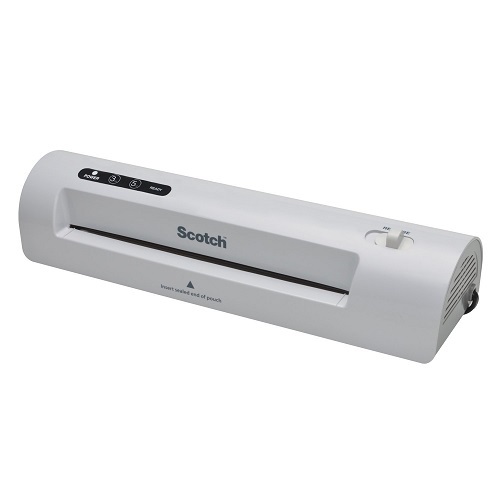 The Scotch Thermal Laminator 2 Roller System (TL901C) is a basic and sturdy laminating machine. It has everything you would need to laminate various papers. It will laminate any Laminate Papers up to 9 inches wide. It would be ideal for a home or an office. It heats up fairly quickly and has two different temperature settings. This laminating machine is a basic and easy to use model. It has everything you would need to laminate standard sized papers. While it is a little bulky in size, it will get your papers laminated in a short period of time. The Swingline Laminator, Thermal, Inspire Plus Lamination Machine is very sleek and thin in design. It heats up very quickly at a fast four minutes. This laminating machine can laminate papers up to 9 inches wide. It also includes a cool setting to laminate heat sensitive items. As long as you don’t have a time crunch, this laminating machine would be a great addition to your home. It is extremely easy to use and thin to store. It even has a cooling function for heat sensitive items. When it comes to laminating machines, it doesn’t get much more compact than the Apache AL9 9″ Thermal Laminator. This is very small; however it still gets the job done. It can heat up and be ready to use in less than a minute. It weighs only 2 pound and is only 1.5 inches thick. It can be stored almost anywhere. Because of the small size, it is harder to get the paper to stay flat. This laminating machine is everything you need in a laminator. It is small and very easy to store. It heats up in a very short amount of time. It is easy to use. The only downfall is keeping the paper flat afterwards. This laminating machine has everything you would need and more. It not only laminates paper up to 9 inches, but it also has a paper cutter and a corner rounder. However, the extra features in the laminating machine are the cause of the excess size. It is very large and more difficult to store. If you are also looking to replace your paper cutter and corner rounder, this is ideal for you. It heats up reasonably quickly and is easy to use. However, because of all the features, this laminating machine will take up a bit of space. 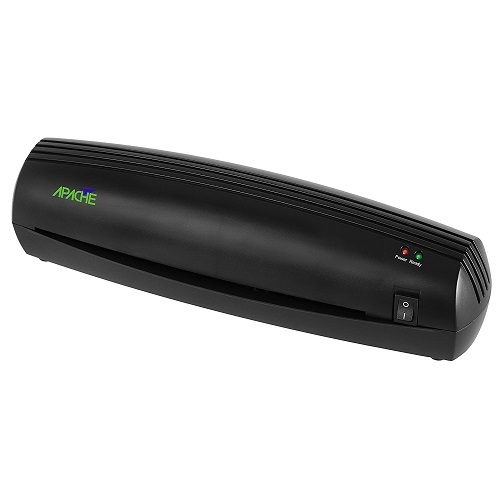 This simple laminating machine has a very sleek and elegant design. It can be used on heat sensitive items with its cool temperature setting. 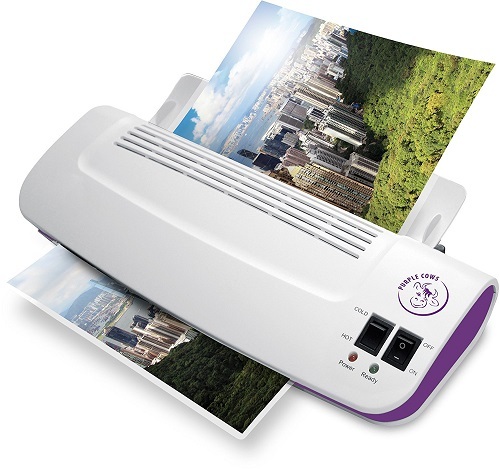 The Purple Cows Hot and Cold 9″ Laminator has a guiding tray to make it easy to put paper through the laminator without much effort. Even with this tray, it is very light and easy to store. Overall, this is a very solid laminating machine. It does everything it is supposed to. 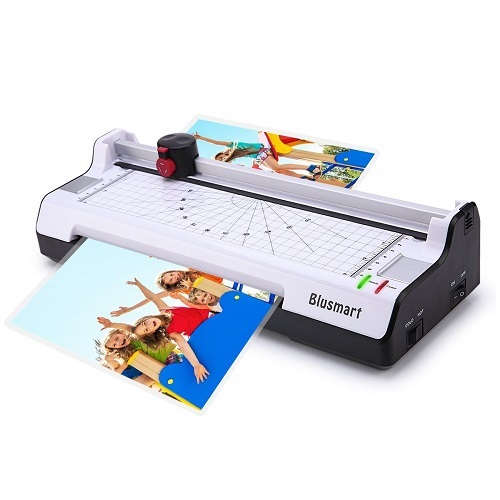 This laminating machine is very sturdy and easy to use. The only downfalls are its size and the smell of plastic while in use. When buying a laminating machine, there are a few important factors to consider. How much space do you have to store it? Laminating machines come in a variety of sizes. The amount of space you have to store it will rule out the type of laminating machine you want to buy. How much time do you have? Some laminating machines take much longer to heat up than others. It can take anywhere from less than a minute to ten minutes to warm up. If you are running short on time, this may cause you to rule out certain laminating machines. When it comes to laminating machines, choosing one depends on what you are using it for. However, when it comes down to reliability and storage, the Apache AL9 9″ Thermal Laminator is a solid choice. 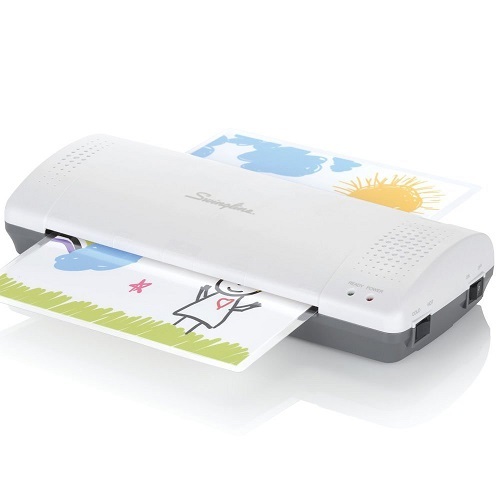 It heats up extremely quickly, it is easy to use, and it laminates papers up to 9 inches wide. This laminating machine is quick and reliable.